DEC operates 12 fish hatcheries and one fish pathology laboratory. Numerous fish species are reared for stocking into more than 1,200 public waters across the state. Annual production averages 850,000 to 900,000 pounds of fish. All hatcheries are open to the public from spring through fall, and several are open year-round. Adirondack Hatchery (518-891-3358) is located about 12 miles from the Village of Saranac Lake in Franklin County. This facility specializes in rearing landlocked Atlantic salmon for statewide distribution. Annual production averages 30,000 pounds of salmon, with most fish stocked as yearling smolts (six inches long) or as small fingerlings in the spring. Round whitefish are also reared at this hatchery. Bath Hatchery (607-776-7087) is located one mile from the Village of Bath in Steuben County. The hatchery rears lake trout, brown trout and rainbow trout. All of the lake trout and many of the rainbow trout reared here are obtained from fish collected from Cayuga Lake. Annual production of all species is about 86,000 pounds. Caledonia Hatchery (585-538-6300), located in Livingston County in the Village of Caledonia, is the oldest hatchery in New York State and the Western Hemisphere. Caledonia Hatchery rears brown trout and rainbow trout. Virtually all of the two-year-old brown trout used in DEC’s stocking program for 13 to 15-inch trout are produced at Caledonia Hatchery. Annual production is approximately 170,000 pounds. Catskill Hatchery (845-439-4328) is located in Sullivan County near the Village of Livingston Manor and near two of New York State’s fabled trout streams, the Beaver Kill and Willowemoc Creek. This facility specializes in rearing brown trout and it maintains a brood stock capable of producing two million eggs. About 115,000 pounds of brown trout are produced annually. Chateaugay Hatchery (518-497-6151) is located near the Village of Chateaugay in northern Franklin County. This facility has a very diverse rearing program which includes Raquette Lake-strain lake trout, brown trout, rainbow trout and brook trout, including the Temiscamie x domestic hybrid used extensively in Adirondack Mountain lakes and ponds. Annual production is approximately 90,000 pounds. Chautauqua Hatchery (716-789-2705) is located near the Village of Mayville in Chautauqua County. This is the only DEC hatchery currently raising pure-strain muskellunge, which are obtained from netting and egg collection on Chautauqua Lake, and in some years, other waters. Pond-reared walleye fingerlings and sauger are also grown at this hatchery. Total production is 3,300 pounds annually. Oneida Hatchery (315-623-7311) is located in the Village of Constantia in Oswego County, on the north shore of Oneida Lake. The hatchery was reconstructed in 1992. The rearing program is focused on walleye, and includes egg collections from Oneida Lake (200–300 million eggs/year), and stocking of millions of walleye fry and up to 220,000 advanced walleye fingerlings (four to six inches). Experimental culture of rare or threatened fishes, such as round whitefish and lake sturgeon, also occurs here. Annual fish production is about 6,000 pounds. Randolph Hatchery (716-358-4755) is located in the Village of Randolph in Cattaraugus County. This is a major brood stock facility which annually handles five to six million brook, brown and rainbow trout eggs. Annual production totals almost 100,000 pounds of fish. Rome Hatchery (315-337-1390) is located in Oneida County about four miles north of the City of Rome. The hatchery is one of DEC’s largest, with annual production totaling nearly 160,000 pounds of brook, rainbow and brown trout. Hatchery staff play a major role in providing fish for airplane and helicopter stocking of remote waters. Rome Fish Disease Control Center, also known as Rome Lab, is located on Rome Hatchery property. Staff maintain brood stock of disease-resistant strains of brook and brown trout, and maintain a laboratory where research activities and disease diagnosis can be conducted. Staff are heavily involved in testing numerous stocks of cultured and wild fish for the presence of parasites and pathogens. Salmon River Hatchery (315-298-5051) is located in the Village of Altmar in Oswego County, is the mainstay of DEC’s stocking program for Lake Ontario and Lake Erie. The hatchery attracts up to 50,000 visitors annually, many of whom come to watch egg collections from steelhead, coho salmon and Chinook salmon returning to the hatchery. Annual fish production totals 120,000 pounds. 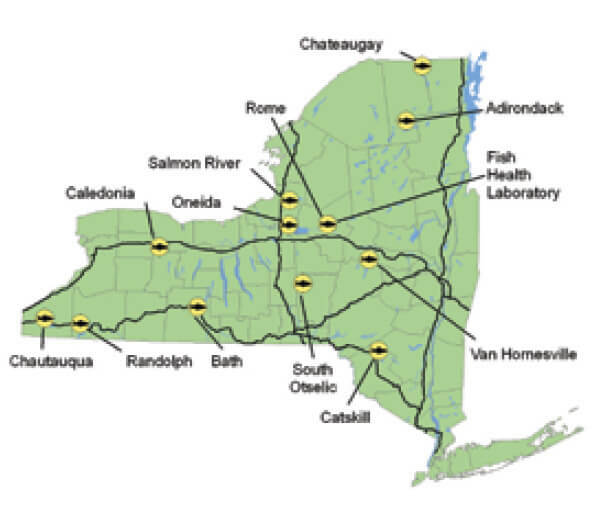 South Otselic Hatchery (315-653-7727) is located in Chenango County in the Village of South Otselic. The hatchery rears the entire statewide supply of tiger muskellunge, produces pond-reared walleye fingerlings, and rears small lots of wild, heritage-strain brook trout. Annual production is 15,000 pounds of fish. VanHornesville Hatchery (315-858-0857) is located in southern Herkimer County in the Village of VanHornesville. The hatchery raises rainbow trout, with production totaling about 30,000 pounds.